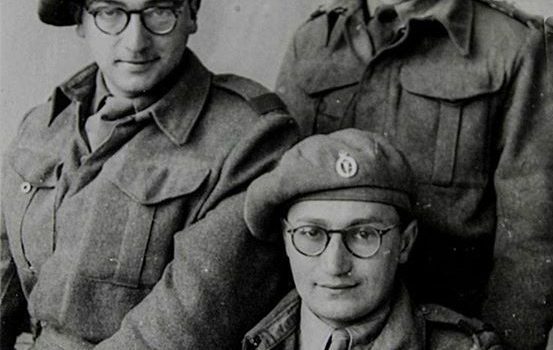 This “rooigevaar” (Red Danger) communist was also a South African Army world war 2 veteran – Joe Slovo (left of picture). Serving as a Signaler in combat operations for the South African forces in North Africa and Italy. His story reflects some amazing twists and turns in South African military history, much of it very unknown. Slovo was born in Obeliai, Lithuania to a Jewish family which emigrated to the Union of South Africa escaping Jewish persecution in Europe when he was eight. Slovo first encountered socialism in South Africa through his school-leaving job as a clerk for a pharmaceutical wholesaler. He joined the National Union of Distributive Workers and had soon worked his way up to the position of shop steward, where he was responsible for organizing at least one mass action. The Communist Party in South Africa has an interesting start and it’s not the “Black revolutionary” movement most people perceive it to be now, originally it was started by white South Africans – and in fact it initially concerned itself only with “whites only” workers rights. The Communist Party of South Africa was founded in 1921 under the leadership of William H Andrews, a Briton who came to Johannesburg to work on the mines. The SA Communist Party first came to prominence during the armed insurrection by white mineworkers in 1922, so brutally suppressed by Jan Smuts’ government. Despite having opposed racialism from its inception, the Communist Party of South Africa (CPSA) supported the white miners in their call to preserve wages and the colour bar with the slogan “Workers of the world, unite and fight for a white South Africa!”. With the failure of the rising, in part due to black workers failing to strike, the Communist Party was forced to adopt the “Native Republic” thesis which stipulated that South Africa was a country belonging to the Blacks. The Party thus reoriented itself at its 1924 Party Congress towards organising black workers and “Africanising” the party. Not quite the vision William Andrews, the CPSA founder, had in mind as white worker party and he promptly resigned as the party’s National Secretary. During World War 2, the attitude to Communism by moderate white South Africans was a little different. Communist Russia was an ally of South Africa during the war and all over the country South Africans rallied to the support of Russia’s war effort against Nazi Germany by donating food, medicine and blood in very successful national “Aid for Russia” collection programs. Joe Slovo joined the Communist Party of South Africa in 1942 and served on its central committee from 1953 (the same year its name was changed to the South African Communist Party, SACP). He avidly watched the news of the Allied fronts, especially the way in which Britain was working with Russia to aid her war effort against Hitler, so Joe Slovo volunteered for active duty, and served with South African forces in Egypt and Italy. After the war he joined the Springbok Legion, a multiracial radical ex-servicemen’s organization which was essentially run by a group white war veterans who embraced Communist values. The Springbok Legion should not be confused with the South African Legion, it was a separate and very politically motivated veterans association – whereas the South African Legion was an apolitical veterans charity. Being politically driven The Springbok Legion became one of key driving forces behind Sailor Malan’s “Torch Commando”, which was the first mass protest movement against Apartheid legislation and made up to a smaller degree by this political veterans association and to a far bigger degree of many members of the apolitical war veterans associations – ironically all mainly “white” South Africans (the franchise of been the country’s first mass protest movement against Apartheid does not belong to the ANC). However it was the smallest of the war veterans associations – The “Springbok Legion” that took a direct “political” role – the Springbok Legion was founded in part by a senior South African Legion member – General van der Spuy (a pioneer of the South African Air Force), and its role took over from what he referred to as the South African Legion’s “painfully correct whisper of polite protest” and became a “shout” of protest instead. The history of the Springbok Legion as a political entity is fascinating – initially formed in 1941 by members of the 9th Recce Battalion of the South African Tank Corps, along with the Soldiers Interests Committee formed by members of the First South African Brigade in Addis Ababa, and the Union of Soldiers formed by the same brigade in Egypt. The aims and objectives of the Springbok Legion were enunciated in its ‘Soldiers Manifesto’. The Springbok Legion was open to all servicemen regardless of race or gender and was avowedly anti-fascist and anti-racist. In collaborating with Sailor Malan’s Torch Commando (and by default Jan Smuts’ old United Party with which the Torch Commando was linked), The Springbok Legion had by now become a fully blown political entity, and the inevitable happened, as with any political party, The Springbok Legion gradually became politically radicalized. This was spearheaded by veterans who where also members of the Communist Party of South Africa (CPSA) and who joined The Springbok Legion and served in its upper and lower structures. The targeting of the Springbok Legion by the Communist Party was the result of the South African Communist Party believing that it could use the veterans to re-order “white” political thinking in South Africa along communist lines. This eventually resulted in the fracturing of the Springbok Legion as a whole as moderate “white” members, who made up the majority of its supporters became disenchanted with its increasingly militant leftist rhetoric. Notable SACP communist party veterans to join the Springbok Legion in a leading capacity where none other than ex-servicemen such as Joe Slovo, but also Lionel Bernstein, Wolfie Kodesh, Jock Isacowitz, Jack Hodgson and Fred Carneso. Aside from the Communists, Key members included future political and anti-apartheid leaders, such as Peter Kaya Selepe, an organiser of the African National Congress (ANC) in Orlando (he also served in WW2). Harry Heinz Schwarz, also a WW2 veteran eventually became a statesman and long-time political opposition leader against apartheid in South Africa and served as the South African ambassador to the United States during South Africa’s “transition” in the 90’s. The National Party – which even as part of it’s pre-war make up had a fierce anti-communist stance was becoming increasingly alarmed by the rise of “white” war veterans against their policies – Sailor Malan’s Torch Commando at its peak attracted 250 000 followers – so they began seeking was of suppressing it. One of the mechanisms was to pass the Suppression of Communism Act. The combined effect of the Act, and the broadening and deepening of the Communist rhetoric and politics was alienating the majority of Springbok Legion members rang a death knell for the Springbok Legion and the inevitable happened, the organisation folded as thousands of its “moderate” members left, returning to the either the apolitical MOTH (Memorable Order of Tin Hats) combat vets only order or the broader South African Legion which accommodated all veterans (or both). The Communist Party members of The Springbok Legion who had played a pivot in its rise and its demise i.e. Joe Slovo, Lionel Bernstein, Wolfie Kodesh, Jack Hodgson and Fred Carneso were now banned and left with little other option they all then joined the African National Congress (ANC) and, given their experience as combat veterans, they also all joined its military wing Umkhonto we Sizwe under the command of Nelson Mandela. The story of Joe Slovo – as the National Party’s arch communist enemy, and the story of the East/West divide over communism and the resultant Cold War, of which the South African Border War along Angola and internal armed insurrection (the “struggle”) all qualify – is well known. That Joe Slovo was eventually identified as military target, alongside his wife Ruth Slovo (a daughter of well known Communist supporter prior to the war, Joe had met Ruth at Wits University), and again the assignation of Ruth Slovo is also well known. The irony for the National Party, is that is was this “public enemy number one”, “Rooigevaar” (as the National Party labeled communists and liberals) Communist that extended the olive branch to the National Party – it was Joe Slovo, who in 1992 proposed the breakthrough in the negotiations to end apartheid in South Africa with the “sunset clause”. Slovo’s “sunset clause” allowed for a coalition government for the five years following a democratic election, including guarantees and concessions to all sides. After the elections of 1994 Slovo became Minister for housing in this coalition government he proposed, serving alongside the National Party as they saw out their “sunset” until his death in 1995. His funeral was attended by Nelson Mandela and Thabo Mbeki. In a further twist of history, by 2005 the National Party closed shop and merged with the ANC, and by default they also joined the party which still remains in alliance with the ANC as a political dependent, none other than …. The South African Communist Party. Such is the cycle of history, go figure!